We have recently digitised a U-matic video tape of eclectic Norwegian video art from the 1980s. The tape documents a performance by Kjartan Slettemark, an influential Norwegian/ Swedish artist who died in 2008. The tape is the ‘final mix’ of a video performance entitled Chromakey Identity Blue in which Slettemark live mixed several video sources onto one tape. The theoretical and practical impossibility of documenting live performance has been hotly debated in recent times by performance theorists, and there is some truth to those claims when we consider the encounter with Slettemark’s work in the Great Bear studio. The recording is only one aspect of the overall performance which, arguably, was never meant as a stand alone piece. This was certainly reflected in our Daily Mail-esque reaction to the video when we played it back. ‘Eh? Is this art?! I don’t get it!’ was the resounding response. Having access to the wider context of the performance is sometimes necessary if the intentions of the artist are to be appreciated. Thankfully, Slettemark’s website includes part-documentation of Chromakey Identity Blue, and we can see how the different video signals were played back on various screens, arranged on the stage in front of (what looks like) a live TV audience. Upon seeing this documentation, the performance immediately evokes to the wider context of 70s/ 80s video art, that used the medium to explore the relationship between the body, space, screen and in Slettemark’s case, the audience. A key part of Chromakey Identity Blue is the interruption of the audience’s presence in the performance, realised when their images are screened across the face of the artist, whose wearing of a chroma key mask enables him to perform a ‘special effect’ which layers two images or video streams together. If an art work like Slettemark’s is moving then, it is because it stages moments where ‘faces’ reflect and interface across each other. Faces meet and become technically composed. Through the performance of personal-facial address in the artwork, it is possible to glimpse for a brief moment the social vulnerability and fragility such meetings engender. Brief because the seriousness is diffused Chromakey Identity Blue by a kitsch use of a disco ball that the artist moves across the screen to symbolically change the performed image, conjuring the magical feel of new technologies and how they facilitate different ways of seeing, being and acting in the world. The tape of Slettemark was sent to us by Videokunstarkivet, an exciting archival project mapping all the works of video art that have been made in Norway since the mid-1960s. Funded by the Norwegian Arts Council, the project has built the digital archival infrastructure from the bottom up, and those working on it have learnt a good many things along the way. Per Platou, who is managing the project, was generous enough to share some the insights for readers of our blog, and a selection of images from archive’s interface. There are several things to be considered when creating a digital archive ‘from scratch’. Often at the beginning of a large project it is possible look around for examples of best practice within your field. This isn’t always the case for digital archives, particularly those working almost exclusively with video files, whose communities of practice are unsettled and established ways of working few and far between. The fact that even in 2014, when digital technologies have been widely adopted throughout society, there is still not any firm agreement on standard access and archival file formats for video files indicates the peculiar challenges of this work. Instead, interested users will be given a research key or pass word which enables them to access the data and edit metadata where appropriate. If users want to re-publish or show the art in some form, contact details for the artist/ copyright holder are included as part of the entry. Although the Videokunstarkivet deals largely with video art, entries on individual artists include information about other archival collections where their material may be stored in order to facilitate further research. 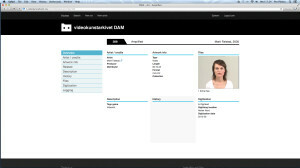 Contemporary Norwegian video artists are also encouraged to deposit material in the database, ensuring that ongoing collecting practices are built-in to the long-term project infrastructure. Another big consideration in constructing an archive is what to collect. Per told me that video art in Norway really took off in the early 80s. Artists who incorporated video into their work weren’t necessarily specialists in the medium, ‘there just happened to be a video camera nearby so they decided to use it.’ Video was therefore often used alongside films, graphics, performance and text, making the starting point for the archive, according to Per, ‘a bit of a mess really.’ Nonetheless, Videokunstarkivet ‘approaches every artist like it was Edvard Munch,’ because it is very hard to know now exactly what will be culturally valuable in 10, 20 or even 100 years from now. While it may not be appropriate to ‘save everything!’ for larger archival projects, for a self-contained and focused archival project such as the Videokunstarkivet, an inclusive approach may well be perfectly possible. Another important aspect of the project is technical considerations – the actual building of the back/ front end of the software infrastructure that will be used to manage newly migrated digital assets. It was very important that the Videokunstarkivet archive was constructed using Open Source software. It was necessary to ensure resilience in a rapidly changing technological context, and so the project could benefit from any improvements in the code as they are tested out by user communities. 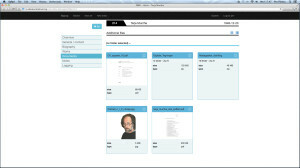 The project uses an adapted version of Digital Asset Management system Resource Space that was developed with LIMA, an organisation based in Holland that preserves, distributes and researches media art. Per explained that ‘since Resource Space was originally meant for photos and other “light” media files, we found it not so well suited for our actual tasks.’ Video files are of course far ‘heavier’ than image or even uncompressed audio files. This meant that there were some ‘pretty severe’ technical glitches in the process of establishing a database system that could effectively manage and playback large, uncompressed master and access copies. 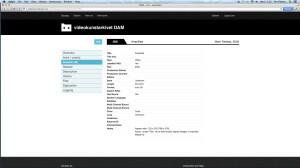 Through establishing the Videokunstarkivet archive they were ‘pushing the limits of what is technically possible in practice’, largely because internet servers are not built to handle large files, particularly not if those files are being transcoding back and forth across the file management system. In this respect, the project is very much ‘testing new ground’, creating an infrastructure capable of effectively managing, and enabling people to remotely access large amounts of high-quality video data. Access files will be available to stream using open source encoded files Web M (hi and lo) and X264 (hi and lo), ensuring that streaming conditions can be adapted to individual server capabilities. The system is also set up to manage change large-scale file transcoding should there be substantial change in file format preferences. These changes can occur without compromising the integrity of the uncompressed master file. 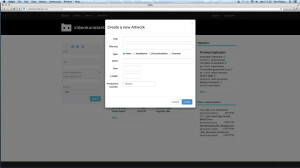 – Research: Researchers/curators can see video works, and almost all the metadata (incl previews of the videos). They cannot download master files. They can edit metadata fields, however all their edits will be visible for other users (Wikipedia style). If a curator wants to SHOW a particular work, they’ll have to contact the artist or owner/gallery directly. If the artist agrees, they (or we) can generate a download link (or transcode a particular format) with a few clicks. Per approached us to help migrate the Kjartan Slettemark tape because of the thorough approach and conscientious methodology we apply to digitisation work. As a media archaeology enthusiast, Per stressed that it was desirable for both aesthetic and archival reasons that the materiality of U-matic video was visible in the transferred file. He didn’t want the tape, in other words, to be ‘cleaned up’ in anyway. To migrate the tape to digital file we used our standardised transfer chain for U-matic tape. This includes using an appropriate time-based-corrector contemporary to U-matic era, and conversion of the dub signal using a dedicated external dub – y/c converter circuit. We are very happy to be working with projects such as the Videokunstarkivet. It has been a great opportunity to learn about the nuts and bolts design of cutting-edge digital video archives, as well as discover the work of Kjartan Slettemark, whose work is not well-known in the UK. Massive thanks must go to Per for his generous sharing of time and knowledge in the process of writing this article. We wish the Videokunstarkivet every success and hope it will raise the profile of Norwegian video art across the world. Founded in 2010, the DPP are a ‘not-for-profit partnership funded and led by the BBC, ITV and Channel 4 with representation from Sky, Channel 5, S4/C, UKTV and BT Sport.’ The purpose of the coalition is to help ‘speed the transition to fully digital production and distribution in UK television’ by establishing technical and metadata standards across the industry. The transition to a standardised, tape-less environment has further been rationalised as a way to minimise confusion among media producers and help economise costs for the industry. As reported on Avid Blogs production companies, who often have to respond to rapidly evolving technological environments, are frantically preparing for deadline day. ‘It’s the biggest challenge since the switch to HD’, said Andy Briers, from Crow TV. Moreover, this challenge is as much financial as it is technical: ‘leading post houses predict that the costs of implementing AS-11 delivery will probably be more than the cost of HDCAM SR tape, the current standard delivery format’, writes David Wood on televisual.com. 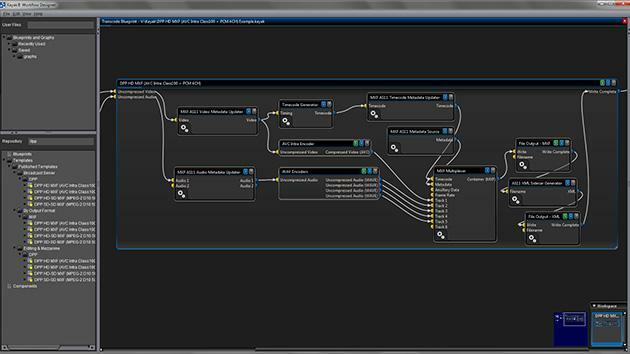 Audio post production should now be mixed to the EBU R128 loudness standard. As stated in the DPP’s producer’s guide, this new audio standard ‘attempts to model the way our brains perceive sound: our perception is influenced by frequency and duration of sound’ (9). The shift to file-based delivery will require new kinds of vigilance and attention to detail in order to manage the specific problems that will potentially arise. The DPP producer’s guide states: ‘unlike the tape world (where there may be only one copy of the tape) a file can be copied, resulting in more than one essence of that file residing on a number of servers within a playout facility, so it is even more crucial in file-based workflows that any redelivered file changes version or number’. This systemic homogenisation described by Stiegler is called into question if we consider whether the promise of interoperability – understood here as different technical systems operating efficiently together – has ever been fully realised by the current generation of digital technologies. If this was the case then initiatives like the DPP’s would never have to be pursued in the first place – all kinds of technical operations would run in a smooth, synchronous matter. Amid the generalised formalisation there are many micro-glitches and incompatibilities that slow operations down at best, and grind them to a halt at worst. With this in mind we should note that standards established by the DPP are not fully interoperable internationally. While the DPP’s technical and metadata standards were developed in close alliance with the US-based Advanced Media Workflow Association’s (AMWA) recently released AS-11 specification, there are also key differences. As reported in 2012 by Broadcast Now Kevin Burrows, DPP Technical Standards Lead, said: ‘[The DPP standards] have a shim that can constrain some parameters for different uses; we don’t support Dolby E in the UK, although the [AMWA] standard allows it. Another difference is the format – 720 is not something we’d want as we’re standardising on 1080i. US timecode is different, and audio tracks are referenced as an EBU standard.’ Like NTSC and PAL video/ DVD then, the technical standards in the UK differ from those used in the US. We arguably need, therefore, to think about the interoperability of particular technical localities rather than make claims about the generalised formalisation of all technical systems. Dis-synchrony and technical differences remain despite standardisation. It is clear that there is no one simple answer to the dilemma of interoperability and its implementation. Establishing a legal commitment, and a firm deadline date for the transition, is however a strong message that there is no turning back. Establishing the standard may also lead to a certain amount of technological stability, comparable to the development of the EIAJ video tape standards in 1969, the first standardised format for industrial/non-broadcast video tape recording. Amid these changes in professional broadcast standards, the increasingly loud call for standardisation among digital preservationists should also be acknowledged. For analogue and digital tapes however, it may well signal the beginning of an accelerated end. The professional broadcast transition to ‘full-digital’ is a clear indication of tape’s obsolescence and vulnerability as an operable media format. 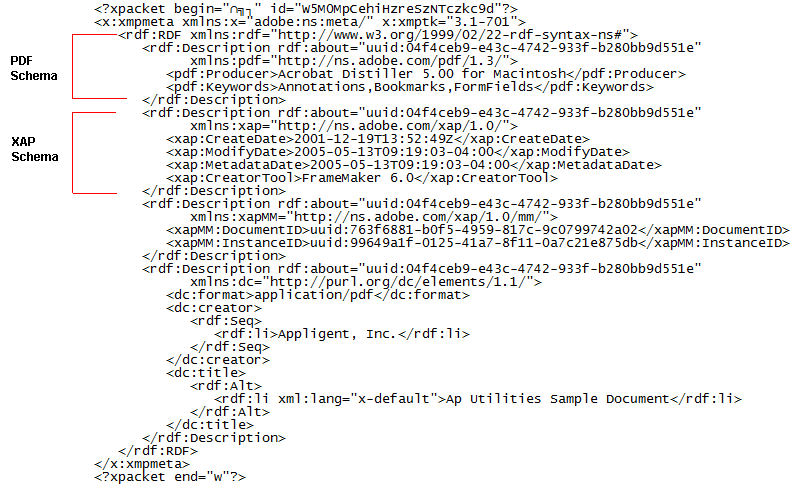 Metadata is data about data. Maybe that sounds pretty boring, but archivists love it, and it is really important for digitisation work. As mentioned in the previous post that focused on the British Library’s digital preservation strategies, as well as many other features on this blog, it is fairly easy to change a digital file without knowing because you can’t see the changes. Sometimes changing a file is reversible (as in non-destructive editing) but sometimes it is not (destructive editing). What is important to realise is changing a digital file irrevocably, or applying lossy instead of lossless compression, will affect the integrity and authenticity of the data. What is perhaps worse in the professional archive sector than changing the structure of the data, is not making a record of it in the metadata. Metadata is a way to record all the journeys a data object has gone through in its lifetime. It can be used to highlight preservation concerns if, for example, a file has undergone several cycles of coding and decoding that potentially make it vulnerable to degradation. As the previous blog entry detailed, digital preservation is a dynamic, constantly changing sector. Furthermore, digital data requires far greater intervention to manage collections than physical objects and even analogue media. In such a context data objects undergo rapid changes as they adapt to the technical systems they are opened by and moved between. This would produce, one would speculate, a large stream of metadata. What is most revealing about metadata surrounding digital objects, is they create a trail of information not only about the objects themselves. They also document our changing relationship to, and knowledge about, digital preservation. Metadata can help tell the story about how a digital object is transformed as different technical systems are adopted and then left behind. The marks of those changes are carried in the data object’s file structure, and the metadata that further elaborate those changes. Like those who preserve physical heritage collections, a practice of minimal intervention is the ideal for maintaining both the integrity and authenticity of digital collections. But mistakes are made, and attempts to ‘clean up’ or otherwise clarify digital data do happen, so when they do, it is important to record those changes because they help guide how we look after archives in the long term. You are currently browsing the greatbear analogue and digital media blog archives for September, 2013.